This past weekend, Event 360 helped bring to life the 14th Annual Florida AIDS Walk & Music Festival in beautiful, sunny Fort Lauderdale Beach. This is the 11th Florida AIDS Walk that Event 360 has produced, and we thought it would be fun to share a retrospective look back to see how this event has evolved. In 2009, the Florida AIDS Walk took place in Huizenga Plaza, a city park along the Riverwalk in downtown Fort Lauderdale. The registration area was set up in a parking structure which, while convenient, did little to enhance the participant experience. In 2012, we moved the event from Huizenga Plaza to Fort Lauderdale Beach, a move that was very popular with participants. 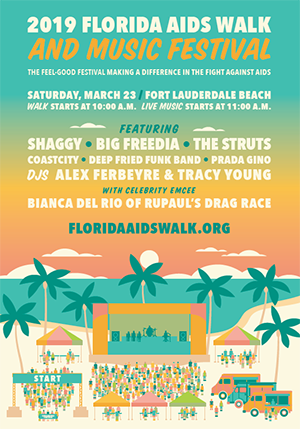 This was also the year the event was renamed—becoming the Florida AIDS Walk & Music Festival to reflect the addition of a concert after the walk—and featured a performance by the B-52’s. Event 360’s contract expanded to include on-event talent management, and the new beach set-up provided us an opportunity to reinvent the event layout. Since adding the “& Music Festival” component, the event has been headlined by performers like Chaka Khan, Salt n Pepa, Flo Rida, and DNCE. This year, in an attempt to leverage the trendy appeal of festival-style concerts with multiple acts, the event featured seven musical performers and two DJ’s over an extended timeframe. Shaggy, The Struts, Big Freedia, and many others rocked the stage, and the festival vibe was enhanced by local vendors, food trucks, signature cocktails served in branded mugs and expanded shade tents with beach furniture. The second big change we implemented this year was moving the event from Sunday to Saturday. Changing the date of an event that’s been around for so many years is always a risk. But we chose to make the move so that we could entice greater attendance from the Spring Breakers who flood Fort Lauderdale throughout the month of March, while ensuring the core community of walkers were still very much in attendance. We saw favorable results from the core crowd, though limited results from the Spring Break crowd. But there was definite value in the effort, and it was a good reminder to focus on the core community. If you ask any of our team members to reflect back on the evolution of this amazing event, the first thing you’ll hear in their voice is a smile. That’s because the Florida AIDS Walk & Music Festival has a rich history in Fort Lauderdale, a deep impact in the local fight against HIV/AIDS, and a great partnership with the city. Plus, it’s just so darn fun! We have been and continue to be so honored to be a part of that history, impact and partnership, and look forward to the years ahead. Janelle brings passion for client satisfaction to the Account Management team with a keen attention to project timelines and dedication to ensuring successful events. She currently works on the Florida AIDS Walk & Music Festival for the AIDS Healthcare Foundation and the Ride for Life Chicago for TPAN.